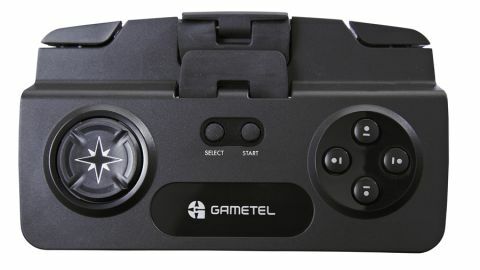 The Gametel was originally designed for Android. The packaging doesn't mention iOS, and omits the micro-USB lead for charging because the assumption is that you already have one. Fortunately, the controller is actually iCade-compatible and is easily paired with an iOS device over Bluetooth. Uniquely for the devices on test, it can house a device in landscape in an extendable clip, although this also means it's uglier than the 8-Bitty and SteelSeries Free. The Gametel D-pad had almost the opposite problem to the 8-Bitty: diagonals weren't hard to find, they were too easy to slip into. The D-pad felt good, but we found it too often lacked precision, causing errors in games that demand tight all-round controls. For titles such as Gridrunner and Forget-Me-Not, we were often frustrated; with more forgiving games such as Ice Rage, the sloppiness was fine; and for platform games where you merely need left, right and action buttons, the Gametel is a potentially decent bet, with action buttons that are responsive enough. Sadly, the Gametel falls down in terms of button mapping. Identical to the 8-Bitty, too many titles map important actions to the tiny centre start/select buttons or the shoulder buttons, which rest on the middle of your fingers.